People want to buy from brands with which they have an emotional connection. Inherently, we trust people more than we trust companies or products. 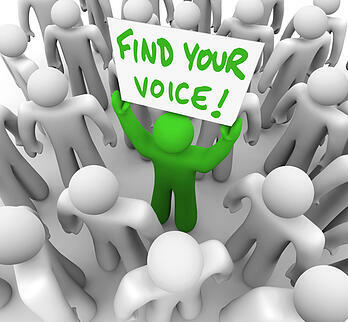 Voice is what brings your organization to life – what creates emotional connections. Subscription services make up a growing niche within the eCommerce world. McKinsey reported that the subscription eCommerce market has grown by more than 100 percent annually since 2013 and nearly one in six online shoppers have signed up for at least one subscription service at some point. The subscription-based business model revolves around cultivating long-term customer relationships and is more focused on retention than acquisition. In a recent interview with ScaleFast, I highlight how the conversation with subscription customers is continuous and provides a unique opportunity for ongoing dialog. Subscription purchase options compel customers to change the way they consider and buy products and the need for a prevailing brand voice. For years, the highly successful subscription service Dollar Shave Club’s edgy brand voice has been attracting consumers’ attention. The company’s use of no-nonsense brand storytelling resonates with audiences—and has been the inspiration of numerous direct-to-consumer subscription services. To such an extent, it was acquired by the legacy brand Unilever for $1 billion—even before it turned a profit. If I had to surmise the fundamental reason this approach was so successful it was because the people behind Dollar Shave Club took the time to align the brand with its target audience by thoroughly understanding what would resonate them. Their brand voice isn’t just arbitrary—it matches their overall branding efforts as a relatable brand and their customer’s trusted friend. A brand that makes you laugh and tells you the truth, but at the end of the day, delivers the products you want. However, it’s important to understand the appeal of your brand; if your brand has a reputation for being staid or appealing to people who prefer seriousness to light-heartedness, going edgy will fail epically. It boils down to knowing who your target customer is and what they will respond to best. So, when you are trying to decide your brand voice, you need to identify a brand voice strategy that will work best with your particular brand and audience. Brands are distinctive and memorable when they have a consistent, relevant brand voice. It is embedded across channels and platforms, in their PR, in the engagement with their fans and social media followers, and everywhere they have a visible presence. The cultivation, management, and protection of that voice require a deep understanding of what your brand stands for and what it does not. If you need help developing or assessing your unique brand voice or optimal brand experience, reach out to our branding consultants to set up a time for us to listen to your brand voice.